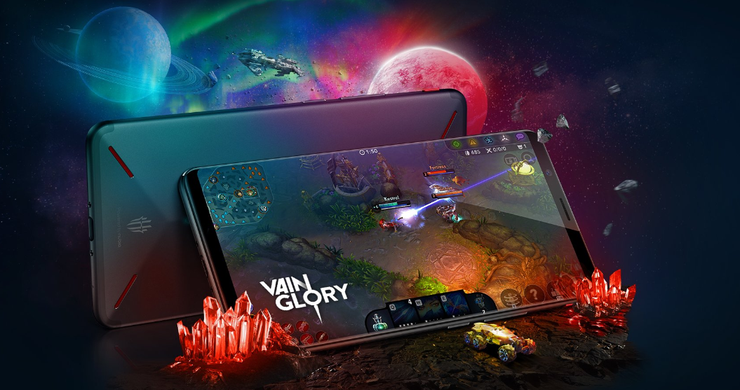 Nubia don't really operate in the Australian region but, if you're game to embrace the perils of importing, their latest "gaming" smartphone might just be worth the risk and trouble of getting your hands on. Announced at this year's CES, Nubia's new Red Magic Mars smartphone runs on a Snapdragon 845 processor and comes in variants that run from 4GB/64GB to 10GB/256GB. In terms of other specs, the Android-powered device also boasts a 6-inch FHD+ display plus a 3800mAh battery. Like other gaming phones, thermals are a major aspect of the package. Nubia say that the Red Magic Mars incorporates a unique, multi-dimensional cooling system that combines both air and liquid cooling. The Red Magic Mars also features a "Game Space" mode that promises to improve performance by minimizing background apps and enhances gameplay with 4D vibration effects. There's also a set of touch-sensitive shoulder buttons similar to that found in ASUS' ROG Phone and a customizable LED RGB backlight on the device similar to Razer's most recent effort. The Nubia Red Magic Mars is due to hit the US and European markets from January 31st with prices starting at US$399. At the time of writing, that roughly converts to about AU$550 - which is pretty competitive when you consider the specs on the device. The company also announced they'll be taking the previously-announced Nubia X to global markets later this month. According to Nubia, the dual-screen flagship smartphone has proved a hit in the Chinese market where the first batch sold out within minutes. Unfortunately, no specific pricing or availability for the Nubia X has been announced.